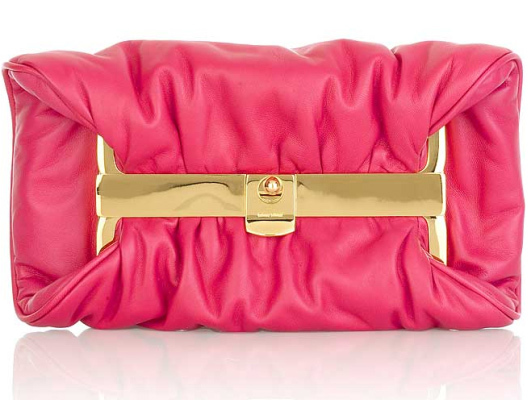 This must be the season of the fold over clutch! Miu Miu offers up the next adaptation of the trend with the Miu Miu Framed fold over clutch ($720), a divinely petite purse. Peonia-colored nappa leather is fashioned into a square-shaped clutch with front ruching and an unexpected front frame closure. The gold hardware against the pink leather is absolutely striking. This uniquely shaped clutch is pure perfection!